Steel road plates are a product from James Dunkerley Steels Limited’s Plates division, and are one of our biggest-selling product lines. We have a broad range of different sizes of steel road plates in stock, already cut and holed, and ready for immediate use on site. They can be used to create a strong surface over which pedestrians and heavy machinery can pass, increasing safety on sites with open trenches in the roadway. For long trenches or where multiple trenches cross one another, several steel road plates can be placed to safely cover the area without gaps. The thickness of the plates can vary, from thin quarter-inch (6mm) plates for fairly light applications, to two-inch (50mm) plates for the most heavy-duty of purposes. 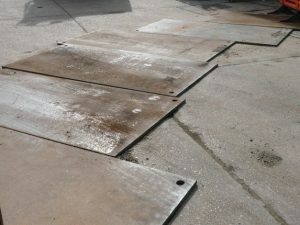 Similarly, the surface area of steel road plates can vary considerably, with our most popular sizes being 6′ x 4′ and 8′ x 4′ – we have these cut and holed ready for use, but can also supply other sizes as needed. These include very large sizes, up to and including inch-thick plates measuring 12′ x 6′. Our largest plates weigh in at over 1,300kg, while a quarter-inch 6′ x 4′ plate weighs just over 100kg, highlighting the breadth of choice available.